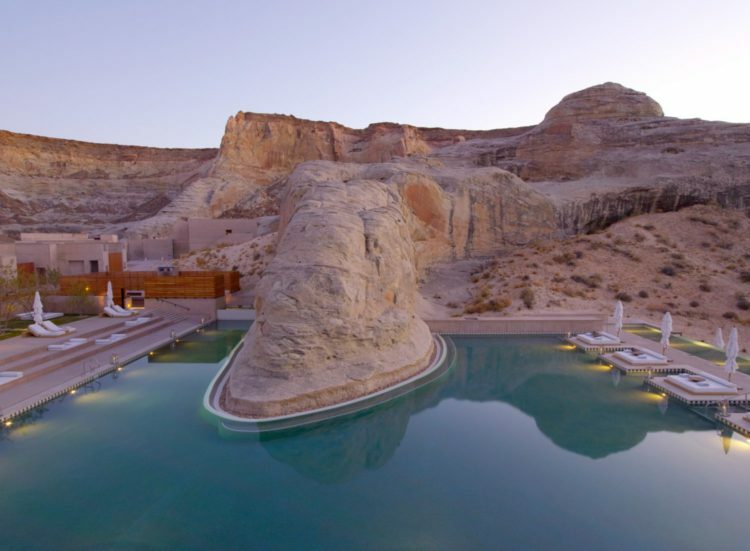 It might seem far out of this world, but Amangiri is very much in this world. The secluded desert oasis is just a 25 minute drive from the town of Page and 15 minutes from Lake Powell in Canyon Point, Utah. You might even be more familiar with this desert locale than you think as it’s favored among A-list celebs like Kourtney Kardashian, Emily Ratajkowski, Shay Mitchell and more. With its low profile and minimalist design, the middle-of-nowhere desert resort has luxury retreat written all over it. 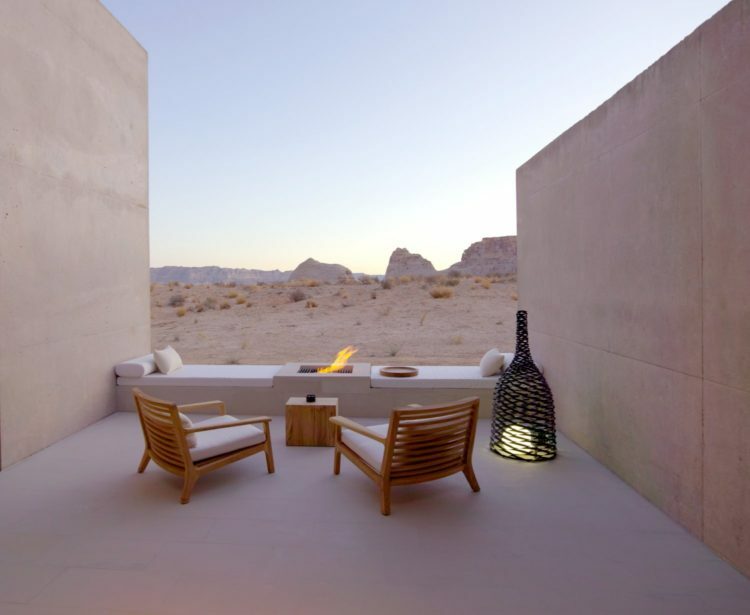 Meaning ‘peaceful mountain,’ Amangiri is located in the Grand Circle region of the Colorado Plateau, surrounded by canyons, mesas, mountains, gorges, rapids and desert. In fact, the resort is located within reach of the highest concentration of National Parks in the country and is surrounded by the largest Native American reservation in the United States. If that doesn’t give you an idea of how exclusive this location is, then consider this: it required an Act of Congress to be passed (literally) in order to build the resort. With just 34 suites, accommodations here feature white stone floors and concrete walls with desert views as far as the eye can see. Each suite includes an outdoor lounge and fireplace, with some even featuring a private pool or roof terrace. For even more seclusion, the four-bedroom Mesa Home is minutes from the resort and has its very own 50-foot infinity edge pool. 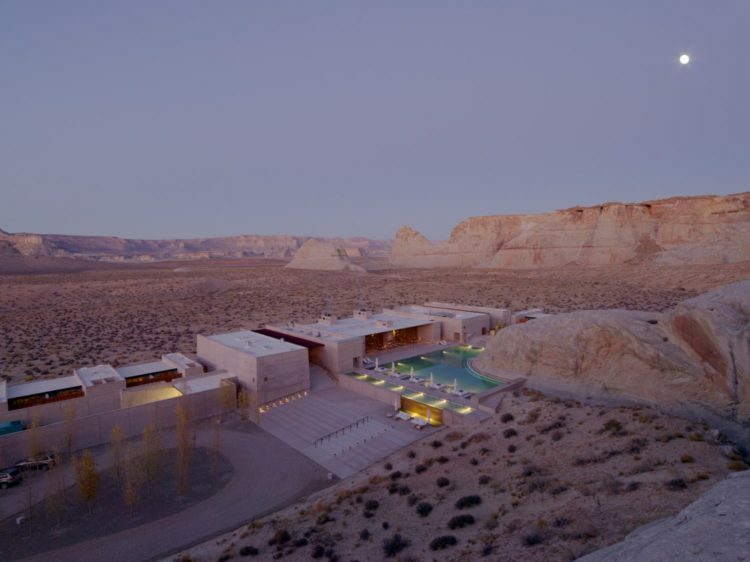 The 25,000-square-foot Aman Spa incorporates the healing traditions of the Navajo through the four elements. The Water Pavilion includes a steam room, sauna, cold plunge pool and heated step pool while the Flotation Pavilion encourages ultimate relaxation. There is also a fitness center, pilates studio and yoga studio, complete with desert views. Guests can dip and dive into the main swimming pool that’s located in a sunken courtyard and framed by the Pavilion and rock escarpment. Lined with king-size daybeds which jut out over the water, the striking blue pool contrasts with the miles of neutral hues, making it desert eye candy as much as a refreshing oasis. 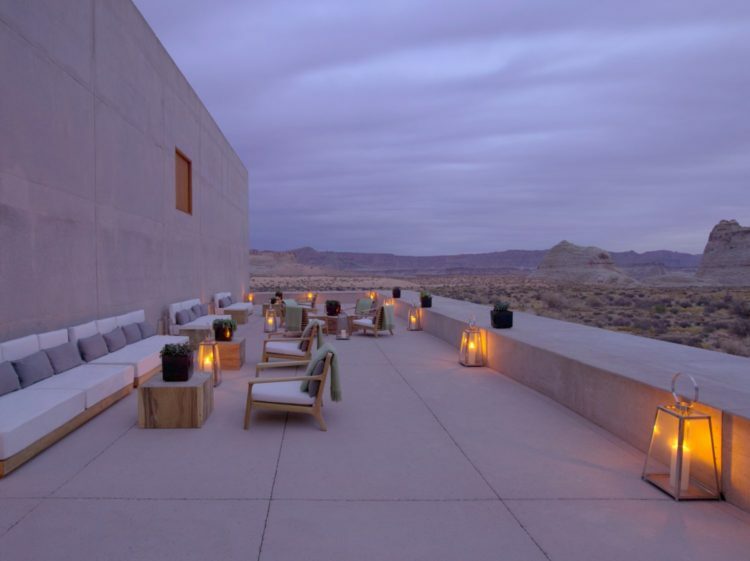 Amangiri’s restaurant allows guests to nosh on American Southwest cuisine served in an open kitchen with stunning views through floor-to-ceiling windows. Dishing out breakfast, lunch and dinner, menus include farm-fresh products and locally sourced ingredients. Dine indoors or outdoors, overlooking the stunning pool. With the hotel’s sweet location, exploring the outdoors is a must. Float down the Colorado River, hike to stunning scenic points, speed across Lake Powell on a motorboat, or take to the skies for a private air tour over some of the region’s top sights like the Grand Canyon, Bryce Canyon National Park or Monument Valley. The resort also offers guided walks through nearby slot canyons, unique sandstone formations characterized by curvy edges and an array of colors.